On Saturday the GSPCA and Grow Ltd teamed up to put on a BBQ and fun day at the Grow Ltd site in St Sampsons. With RSPCA Freedom Food and a veggie selection, home made cakes, animals to see, games and of course a huge plant sale, the day kicked off at 10am and the team from Grow and the GSPCA had a wonderful day with the many visitors that popped in. On Saturday 21st June the GSPCA & Grow Limited have teamed up to put on a fund raiser at the Grow Limited site on Les Petit Quartiers, Coutanchez, St Sampsons. Starting at 10am and running until 3pm there will be lots to see and do. 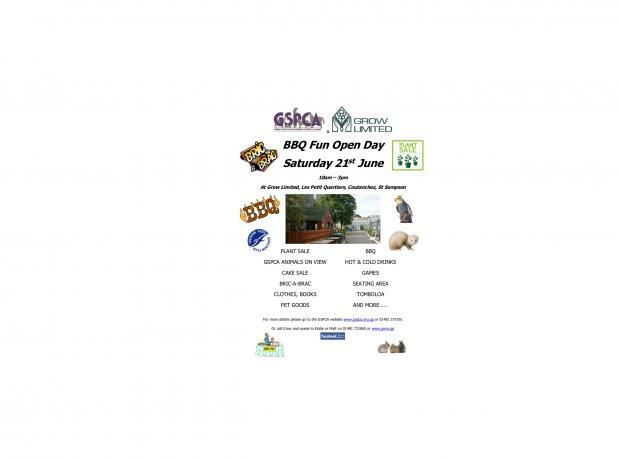 From animals looking for homes to a huge plant sale, bric-a-brac to a BBQ with RSPCA Freedom Food from Perelle Butchers, cake sale to tombola, pop along and join in the fun.